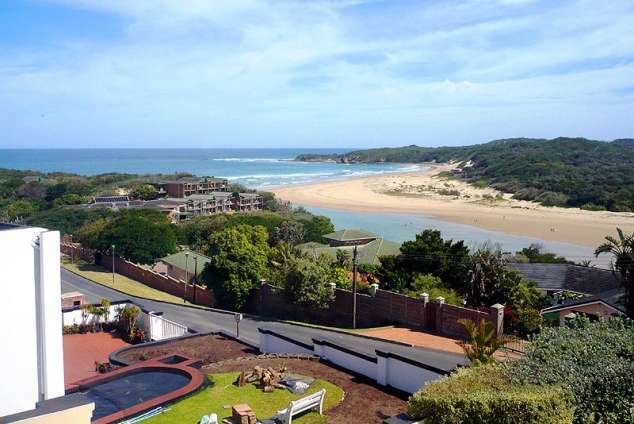 Seaview Place Bed and Breakfast - Beacon Bay Accommodation. Awaken to the sound of the ocean. Seaview Place is located in the upmarket Blue Bend Area just a 2 minute walk from the beach, yet only a short drive away from the growing business and shopping centre of Beacon Bay. We are also close to the major thoroughfares. We offer 3 luxurious bedrooms - 2 with wonderful views of both the beach and river and 1 with a garden and pool view. All are very spacious with new generous bathrooms. All rooms have air conditioners ... summer is here and the humidity is bad!! Tea and coffee facilities are provided as well as a fridge and microwave all neatly built in behind cupboard doors. The TV's are big (74cm) with M-Net and DStv as well as Internet connections. We offer superior accommodation at affordable prices. Try us - you'll be pleased you did! Privacy and friendly hospitality. Hearty traditional breakfasts. Healthy continental breakfast. Off-street parking on the property. New luxurious accommodation. Air conditioning The TV's are big 74cm. A mini kitchen in a cupboard. Salt water swimming pool. Braai facilities. Laundry on request. Dinner on request. After the airport - carry on along Settlers Way crossing the Steve Biko Bridge. Cross two sets of traffic lights (Fleet Street) into town. And carry on straight after the traffic circle. Carry on along Fleet Street until the stop street at the intersection of Fleet and Fitzpatrick Road. Carry on along Fitzpatrick Road, this will become Valley Road and then the Highway. Once on the Highway you will take the Beacon Bay off-ramp on your left. Go over the Batting Bridge across the Nahoon River and take your first turn right. Carry on along Beaconhurst Drive until the Engen Garage. Turn right into Hillcrest Drive. Carry on for approx. 1km until Blue Bend Place and turn right. We are no. 12 Blue Bend Place on the left hand side of the road. 36396 page views since 27 Nov, 2007.